Vets in rural practice face especially difficult illnesses, physical conditions, and emotional trials. Their work environment is not that of dog and cat vets who see their "patients" in sterile urban offices. Dr. Karlene Stange embraced these difficulties because her work led her to spiritual awareness and even bliss, despite the inevitable losses and horrors. She found that her experience was described in Jungian psychology: animals led her to her anima, her true inner self and what in Latin means "soul," "breath," and "life itself." Case examples from her practice illustrate Stange's journey to understand the spiritual nature of the animal-human bond. This led her to Buddhist, Christian, Sufi, Islamic, Jewish, Hindu, and pagan teachings. Her evolved understanding offers readers a unique interpretation of our love for animals, a compelling tour of spiritual traditions, and, ultimately, a healing and joyful engagement with the creatures with whom we share our planet. 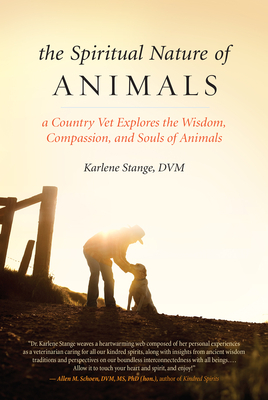 As a child, Karlene Stange, DVM, wanted to be an "animal doctor" before she knew the word "veterinarian." Today she incorporates acupuncture, traditional Chinese herbal medicine, and nutritional therapy into her Rocky Mountain practice. She often speaks at conferences and lives in Durango, Colorado.